She suffered serious damage to her lungs, ribs and spinal cord in the balcony collapse. ONE OF THE survivors of the Berkeley balcony collapse has returned to university in Dublin. Clodagh Cogley, 22, is back studying at Trinity College Dublin while continuing to receive in-patient rehab treatment, according to a statement posted on her GoFundMe page. Clodagh, who travelled home to Ireland in August, suffered serious damage to her lungs, ribs and spinal cord in the June incident, which killed six people and injured seven. She has now moved back into her family home, which is being adapted to meet her needs. The statement on her GoFundMe account said: ”Thanks to the extraordinary generosity of so many contributors, and the many fundraising events that have taken place and are yet to be staged, we estimate that Clodagh will soon surpass her target to cover short and medium term expenses. We’re forever grateful to those who gave up so much of their time, resources and money. We’ll never be able to thank everyone individually but we’ll do our best and we hope that the outpouring of goodness and the kindness of so many will linger as a positive legacy to the dreadful tragedy that took six wonderful young lives and that caused such sadness. Writing about her recovery in June, Clodagh said she would likely never be able to use her legs again. “The fall from the balcony left me with two collapsed lungs, a broken shoulder, a broken knee, five broken ribs and a broken spinal cord… Meaning the chances of me using my legs again are pretty bleak,” she wrote in a Facebook post. The thing I’m taking from this tragedy is that life is short and I intend to honour those who died by living the happiest and most fulfilling life possible. Enjoy a good dance and the feeling of grass beneath your feet like it’s the last time because in this crazy world you never know when it might be. Email “Berkeley survivor Clodagh Cogley is now back in college”. 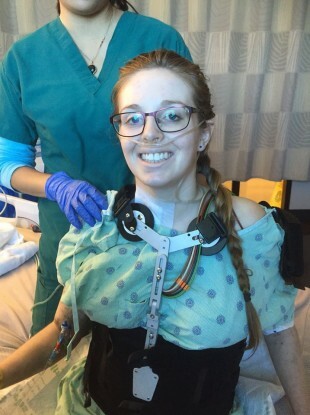 Feedback on “Berkeley survivor Clodagh Cogley is now back in college”.